Throughout his professional career, Professor Noël Amenc has reconciled academic requirements with a concern to render his work operational. This approach has led him to pursue a double career in both research and business. Noël Amenc is currently professor at EDHEC and CEO of ERI Scientific Beta, a new venture by EDHEC-Risk Institute in the field of smart beta indices. As far as his career in business is concerned, from 1993 to 1999, Noël Amenc created and presided over SIP SA, a specialised portfolio management software publisher. From 1999 to 2004, Noël Amenc was Director of Research with Misys Asset Management Systems and in charge of the MAMS R&D centres. Noël Amenc is also associate editor of the Journal of Alternative Investments, member of the editorial board of the Journal of Portfolio Management, and member of the advisory board of the Journal of Index Investing. 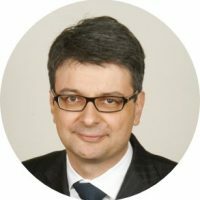 He is a member of the financial research committee of the Monetary Authority of Singapore, and has been a member of the Consultative Working Group of the European Securities and Markets Authority Financial Innovation Standing Committee and the French Financial Markets Authority.